guilds, The Valyermo Dancers draw their name and inspiration from The Benedictine monks of St. Andrew’s Abbey in Valyermo, California. As a dance-theatre company, its mission is the preservation and translation of biblical narrative and poetic traditions into contemporary dance. From 1979 to 1989, the company was pleased to claim Loyola-Marymount University as its home away from the abbey. During that ten year relationship with the university, the Valyermo Dancers and its artistic director, John West, were able to enrich the performance concentration of the university’s dance department by demonstrating the spiritual or interior motivation of dance in both studio and performance contexts. 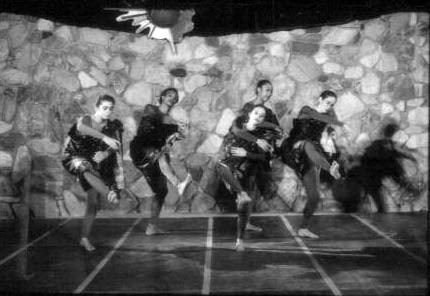 Of particular note in this regard was the use of Mr. West and some the company’s dancers in the LMU Dance Department’s 1986 reconstruction of Doris Humphrey’s Shakers. In this particular endeavor, the element of the “spirit” was critical to the successful performance of the work; John West was assigned the responsibility of developing that spirit in the student performers. Mr. West also taught classes, facilitated workshops, and guest lectured in dance history classes about the pre-Christian and medieval periods of dance. Complementing his lecturing and teaching assignments at the university, the company performed annually in the LMU dance department’s “Faculty and Majors Dance Concert” throughout those years. A long and broad performance history includes the International Seminar on the Bible in Dance in Jerusalem [‘79], a performance for which which they received recognition in Dance Magazine, and the Australian Bicentennial Conference on Sacred Dance [’87]. Other highlights include the Papal Mass Pre-Liturgy Celebration at Dodger Stadium [’87], commissioned by Radio City Music Hall Productions; the Los Angeles debut of composer Marty Haugen’s Agape  and his world debut of The Feast of Life: Stories from the Gospel of Luke . The Valyermo Dancers' repertory includes three full length ballets, God’s Troubadour: An Original Jazz Ballet on the life of Francis of Assisi  that featured Carla DeSola; Dark Virgin: An Original Modern Ballet on the Virgin of Guadalupe ; and Lux Hodie: A Theatre Piece for Performing Artists in a Sacred Mode on the life of St. Benedict . Lucien Deiss’s original music provides the setting for the company’s presentation of The Passion of Our Lord According to John, released for distribution and purchase by World Library Publications in January of 1998. In the summer of 1972, five dancers formed the original Valyermo Dancers with the purpose of providing a danced parable or medley of psalms as the monastic vespers ceremony for the monastery’s fall arts festival. The reception of the vespers performances was enthusiastic enough to warrant continuation of the company’s work throughout the rest of the calendar year. Today, the company numbers over 20 men and women dancers; the majority of the Valyermo Dancers live throughout Southern California, from San Diego to Lompoc. Even Washington State is home to one of our own.